I posted on a Canon Rebel T1i deal recently very similar to this one from Amazon and we bought our first DSLR from that! 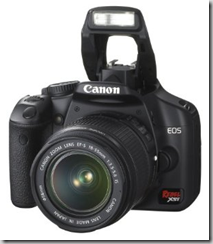 Canon Rebel XSi is one of the top best selling DSLRs around. Usually the Canon Rebel XSi with the 18-55mm kit zoom lens and a $300 Canon 55-250mm telephoto zoom lens cost you around $820+. Amazon has this rare promotion where you instantly get $200 off of this whole purchase. Instantly. No mail in rebates. This could be your first entry-level DSLR purchase too. Read on! For full details on this deal, go to this Canon Rebel XSi DSLR deals page in Camerani.com. 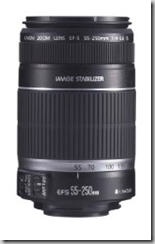 This is an incredible deal for an awesome entry-level DSLR kit along with a 55-250mm telephoto zoom lens for $620.00. We bought the Canon Rebel T1i in a similar deal and couldn’t be happier with our purchase. For more information, check out this Canon EOS 500d buying guide.